Simulcast with Livestream combines the flexibility and ownership of the Livestream platform with the reach and engagement of your viewers’ favorite destinations. 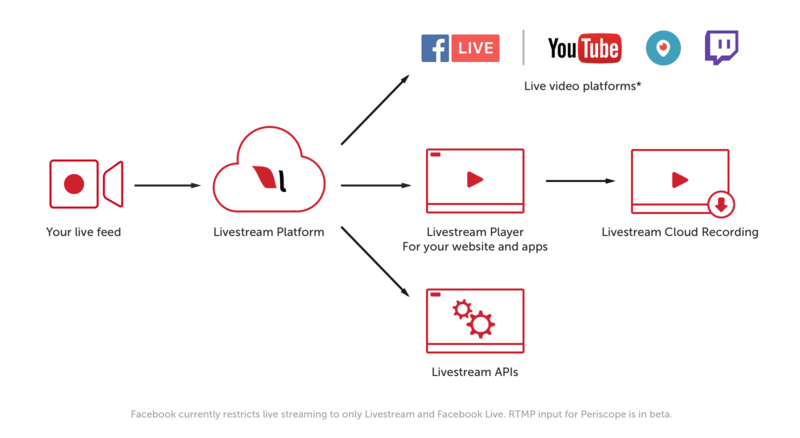 Now, with the Livestream platform, you can reach millions of viewers on RTMP-enabled streaming destinations such as YouTube Live, Periscope, and Twitch when you become a Premium or Enterprise customer. Per our previous announcement, you can also stream to Facebook Live through the Livestream platform. Update: Producers using Simulcast can now stream to multiple Facebook pages from their Livestream account. For more information and instructions on how-to, see our Help Center Article. With these tools, Livestream is now the key point of distribution for all your live content, enabling you to reach your audience wherever they are. Simulcasting gives you all of the Livestream features and benefits – including white labeling, analytics, and support – with the reach and scale of additional platforms. Livestream users have access to a stream key in their account settings. Copy the RTMP URL and stream key from popular destinations such as YouTube, Periscope, or Twitch into your Simulcast settings. Activate Simulcast on all your events or an event-by-event basis. For more information and how-to, visit our help center article.